Popular Preachers Past, Part 2: Charles Spurgeon's Spiritual Comfort Food –I figured Spurgeon would be dull, and he was. But not as bad as I figured, and it was more interesting to discover that in him were the seeds of a lot of our modern problems in Western Christianity. He’d fit right in with today’s popular writers like Lucado and Swindoll. Atheism's Benny Hinns -- Do atheists really think miracles are impossible? No, they don’t. The very things they deride as impossible in the Bible, they believe could be possible in reality. Where? Find out here. The Slave Chains, Part 1 – John Loftus was complaining lately that God should have made it more clear that slavery was wrong. In this series, in which we look at pro- and anti-slavery literature of America, we’ll find out whether God made the Bible clear enough so that American chattel slavery should have been recognized as wrong. The answer for Part 1 at least is that He did. The featured writer this time is abolitionist author (and Biblical scholar of his time) Henry Drisler. The King James Konundrum, Part 2 – The second and last of a series with Rodney Wyrick in which we examine the arguments of King James Onlyism. Ministering to Cult Members -- This is the text of a talk I did at my local church, to a group of counselors who wanted to know how to deal with people who had been trapped by cults. Just general advice, as opposed to examination of specific cults (we did do some of that in Q and A). In light of this consider also this commentary from Thomas Sowell. I must say you present a valid explanation if you don't take the Bible in a literal sense, however, for those that do, hell being both fire and darkness is a very simple explanation. Hydrogen burns at ultraviolet and is one of the hottest known flames. There’s a number of problems with this, of course, and I duly pointed them out. One is that this does not account for the fact that light and water are clearly used as opposing metaphorical images. The second is that the flames are analogized to those in Gehenna, which certainly were not caused by hydrogen. Either of these words would have done well to represent, phenomenologically, the sort of invisible flames that these objectors suppose might be intended – which, to ancient observers, would seem to be nothing more than scorching heat emerging from an unseen source. Since indeed Revelation and Peter use these words in a judgmental context, it is hard to see why a word for literal fire would be used in the other passages, if what we have is invisible flames caused by hydrogen. I could also point out that it is fairly clear that the rich man (Luke 16), if we take this with literalism, is obviously seeing the flame that is causing his torment. Of course, we could always hypothesize that people in hell are given special “x-ray vision” powers (or glasses) that enable them to see the hydrogen flames. Or maybe we could say that in hell, everyone is given special revelations or education about the nature of hydrogen. But that would be a contrivance, now….wouldn’t it? Quick and easy is good today anyway with a full schedule otherwise. We're also fixin' to have a guest post Friday. The last two chapters of Scribal Culture, like the rest of the book, contain some familiar material on the formation of the OT canon. So again, we’ll focus on some points of difference. Van der Toorn discusses how revelation emerged as a model in the ANE and hypothesizes that it was putting words in writing that gave them their authority as revelation. My study on the interaction of orality and writing leads me to doubt that this is the case. Rather, orality and writing would be more likely to continue to work in tandem, with orality serving as a corrective buffer to the written tradition. 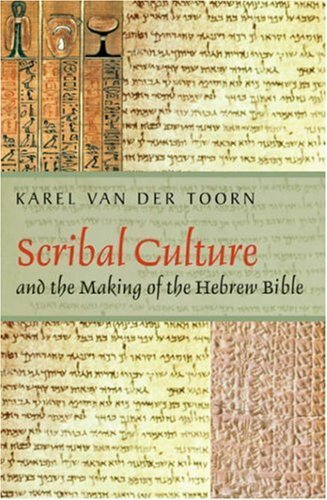 Van der Toorn’s vision of written materials supplanting the oral tradition  simply doesn’t jibe with what we know; in essence, he is repeating the same error Werner Kelber made with respect to the New Testament (which error, Kelber later repudiated). Van der Toorn holds to the view that Jeremiah is here referring to the “found” copy of Deuteronomy in the Temple. I’d like to look at more detailed arguments respecting this at a later date, but I do find it curious that scholars like van der Toorn who are so ready to invent a collection of unknown documents for the sake of the JEDP theory, suddenly become much more narrow in their perceptions and cannot conceive of Jeremiah here referring to some other document – like a corrupted version of the law – that is no longer with us. That’s all in terms of dispute; beyond this van den Toorn offers some interesting hypotheses concerning the origins of the OT canon is either an official Temple library collection, or in the curriculum of OT scribes. Either one of those theories would be quite sensible. In the final analysis, Scribal Culture would be a fairly good book to check out from a library; most Tekton readers will find too much of it repetitive to warrant a purchase. Continuing our observations on this volume, we have just a few notes from Chapters 5-9. From this van der Toorn somehow gets the idea of a new text being composed from old ones after the manner seen by JEDP theorists. But this is far from sufficient, not the least because there is no specification about to what extent this alleged “weaving” was done – as some JEDP theorists see “weaving” done to the point where alternating verses come from different sources. In contrast, it appears that the Sukikku corpus, from van den Toorn’s description, was a collection of well-defined topics (such as “behavioral omens”) as opposed to (per JEDP theorists) narrative material. Moreover, taking van der Toorn’s report at face value, it is the older manuscripts that are seen as “twisted threads” – not the scribe’s new version. In the end, this provides little in support of JEDP composition theories, since we are given no idea from van den Toorn to what extent “integration” of the Sukikku texts was done – whether it was an integration of large blocks of well-defined topical material (requiring little to no juggling of texts), or (as in JEDP) scattered bits and pieces from multiple documents (which would have required extensive juggling). In chapters that follow, there is little new; van den Toorn appeals to some standard arguments for the disunity of the Pentateuch, and simply presumes such disunity (rather than arguing it) for the bulk of what follows. But this does not mean his more neutral observations are not adaptable to our views. For example, we can easily agree to the idea of successive “editions” of Deuteronomy  as the text was updated over time to make it more intelligible to later readers, even if we do not accept the radical extent to which van den Toorn proposes changes. We’ll conclude with any notes on the last two chapters tomorrow. A critic suggested this book, which we’re going to look at over the next three entries; it’s got all the appearance of being one of those useful background texts I like to recommend, which is ironic since this critic apparently thought it’d be full of stuff that would debunk me. Today we’ll look at Chapters 1 through 4, which takes up over a third of the book proper. Actually, of the book’s 401 pages, from 267 on is notes and end matter. From this alone you can guess that Van der Toorn is providing something that the average reader can manage in his main text, while also offering depth for the more interested reader in the notes. What’s in the first four chapters, though, will not be new to a lot of Tekton readers: It’s an Old Testament variation of what Gamble offered in Books and Readers in the Early Church. 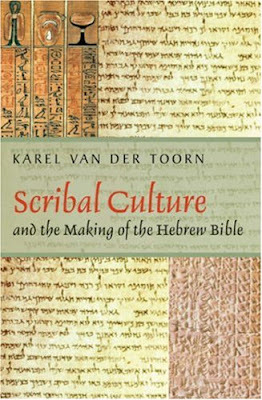 In many ways, things were not a lot different on these matters in the OT era, so much of what Van der Toorn offers will be familiar as he discusses the role and function of scribes, the production of books, and the interaction of orality and literacy in the Old Testament world, among other subjects. “In the Ancient Near East, it was uncommon for an author to sign his or her work.”  Hence it is no surprise that we have so many “anonymous” OT books (the Samuels, the Kings, etc). Even Babylonian and Assyrian texts named not the author of the text, but either the name of the scribe or the name of the owner of the text. One point I’d derive from this is one I have used often already: When Moses is said to be the authority behind the Pentateuch, it never means that he personally wrote it. Rather, though he may have authored some of the texts, his main role would be that of an authority who stood behind the text and caused it to be made. Another concept Van der Toorn introduce is that of honorary authorship. This is a case of a text being ascribed to a patron who ordered the text, as opposed to the scribe who wrote and composed it. Once again, it is in this sense that it ought be argued that Moses, for example, “authored” the Pentateuch. However, critics continue to work with a modern definition of authorship in their criticisms. He also points out that our concept of authorship is tied to notions of authors as individuals; but because in the ancient world, “an individual is indistinguishable from his or her social role and social status,”  authorship is itself an expression of role, and that as mouthpiece and crafter of the values of the community the author represents. In that sense, authorship is in a real sense communal . I should also relate this to theories by NT scholars that the Gospels are the products of anonymous “communities”. The main problem with such theories is not that the pose communities per se, but that they manage to invent them out of whole cloth and posit radical ideological differences based on even minor points. A final useful point from the first four chapters: Scribes were part of a literate elite, and were generally scholars – as well as public speakers . After all, most of the people couldn’t read what they wrote, so it had to be read to them. A fascinating tome so far – we’ll look at a second section Monday. 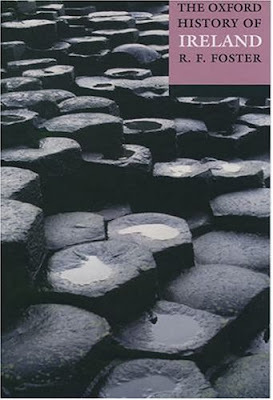 Reads for Fun: R. F. Foster's "The Oxford History of Ireland"
I mentioned in an earlier post that my current Reads for Fun wasn’t being much fun. It isn’t that The Oxford history of Ireland isn’t informative; it’s just dull as dishwater. Some historians can write well. The contributors to this volume can’t, unless they’re doing copy for Nytol ads. If you can bear the drudgery, though, there’s a lot of fascinating background information here that fills in the gaps of the longstanding rivalry between Catholics and Protestants on the Emerald Isle – showing that it isn’t simply one of those “religion poisons everything” fights, but something rooted deeply in the politics of Ireland’s history as a somewhat uncomfortable member of the British Empire. The Irish psyche, from what these authors say, has been deeply affected by this relationship; comparisons might even be drawn to the treatment of certain Native American tribes. I’d say more if this book were more memorable, but it wasn’t. For example, it describes battles that occurred in various wars in ways that make the accounts of wars in the Book of Mormon look like high drama. Hopefully my next one will be more fun. I’ve just submitted a paper proposal for the annual ISCA (International Society of Christian Apologetics) meeting to be held the weekend of April 29-30 in Raleigh, NC (see link below). It may or may not get a spot, but I’ve put my abstract below; it’s based on another article on mine (link below). Nick Peters plans to be there, too, and Paul Copan and Bruce Little will be featured speakers. The topic for this round is the problem of evil. Here's my paper proposal...don't be stealin' it, now, or Cap'n Kirk will getcha! The Star Trek television series features a concept called the “Prime Directive” in which members of Starfleet – the human race as space explorers – are forbidden to interfere in the development of cultures that have not yet reached a certain level of technology. Discussion of the virtues of the Prime Directive by fans of Star Trek offer some useful parallels to discussions over why God does not step in and immediately solve the problem of evil. It is clear that under certain circumstances, even secular humanists like Star Trek creator Gene Roddenberry regarded non-interference by more powerful forces as a virtue – even when those powerful forces had the means to put a stop to evil and suffering. A reader pointed me to an article (link below) about a book out by Biblical scholar Maurice Casey titled, Jesus of Nazareth: An Independent Historian’s Account of His Life and Teaching. It should be interesting. Casey is a bit of a mixed bag; on the one hand, his treatment of subjects like the Son of Man title in Daniel 7, and how Jesus used it, is lamentably deficient on several points; on the other hand, he sure took down the so-called “Abiathar problem” in Mark. (Links below.) Bottom line is, Casey is an independent thinker who’s worth a listen when he talks – but someone you also sift with a critical eye. I checked contents of the book, and it’s nice to see Robert Price is one of Casey’s targets – extensively so. Frank Zindler gets a heavy hammer on his head as well. Casey also has a few unkind words for the liberal wildcats out there, like Jane Schaberg; no one is spared his wrath. (The article describes him as “eviscerating everyone and everything wrong with his field.”) A bit curmudgeony, no doubt, but I expect that will make the book all the more entertaining. He also presents an interesting answer to the issue of Mark 1:41, which Bart Ehrman makes a big deal about seeing Jesus as “angry”. His answer is to root back into Aramaic, as he did with the Abiathar problem, and see behind “angry” an Aramaic word that can mean both “tremble with anger” and “moved” (as to sympathy). I wonder what Bart Ehrman will say about that one. On the other hand, it isn’t hard to see that his treatment of miracles won’t do the job. Casey apparently resorts to thinking Jesus cured “hysterical” illnesses, which we have shown will not work. (Link below.) He also apparently buys into the theory that appearances of Jesus were “bereavement visions” – which both I and my co-author Jonathan Kendall in Defending the Resurrection, and Mike Licona in The Resurrection of Jesus, have shown will not do the job. I’ll get this book eventually, but not any time soon: At $30 a pop for just the paperback (! -- $130 for the hardback!) it’s a little out of my budget range. But if you happen to be able to see it in a library, it might be worth a look. Article in McLean's about the book. 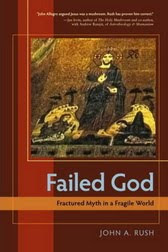 Book Snap: John Rush's "Failed God"
John Allegro made headlines (and a fool of himself) speculating that “Jesus” was a code word for a sacred mushroom the early Christians got high on. John Rush in Failed God (FG) takes it a step further, arguing that all three major monotheistic faiths – Christianity, Judaism, and Islam – all got their starts as mushroom cults. At over 400 pages, and with Rush having an argument style that commends itself mainly to be read to the tune of falling bricks, we won’t be looking at the entirety of FG; it will be enough to review the 150 or so pages on Christianity. There’s the usual gag about how Paul corrupted Jesus’ teachings, under the premise that Paul filled it with all sorts of rules and regulations that Jesus dispensed with as an advocate of “personal responsibility”. There’s an oddity here though inasmuch as exactly the opposite s argued by various “Paul haters” like Doug del Tondo: He says, no, Jesus taught rules, and Paul advocated libertine behavior. The solution to this paradox is that both sides are wrong: Both Paul and Jesus still had use for rules AND for personal responsibility – which makes sense, as they tend to appear together in the moral record. But most of what is in here amounts to simple assertion without documentation. Jesus is declared likely a non-existent person (“absolutely no historical visibility”) constructed by power-seekers to fool the masses, but if you expect Rush to deal with Annals 15.44, for example, be prepared to be sadly mistaken. (Maybe Tacitus was on reefer, too.) He deals with Josephus, merely resurrecting all the standard canards, and quoting such reliable Josephan scholars as C. Dennis McKinsey (!) to settle on the conclusion that the whole thing is a forgery. Tacitus? Not even mentioned. Paul: He was put on a drug trip by Gnostics, maybe, while on the road to Damascus – maybe. Why believe this? There’s no apparent reason other than that Rush can’t figure it out otherwise. He certainly didn’t do much serious research to get answers that might make sense otherwise. He remarks upon Paul’s letters as strange products (“rantings-in-ink”) but there’s not much sign that Rush has bothered to crack open any sort of scholarly tome on any of them, much less acquainted himself with the sort of Greco-Roman rhetorical forms which informed the format of Paul’s letters. (But maybe Quintiallian and Cicero were on ‘shrooms too.) Complex issues like the dates of the Gospels are settled with a claim that those who advcoate early dates are “biased intellectuals…who want to believe in the existence of Jesus and his mythic storyline.” For Rush, all you need to settle an argument, apparently, is to select from a roster that includes the following: 1) You’re biased. 2) You’re deluded. 3) You’re on drugs. 30 pages of this nonsense was enough – Rush has all the appearance of the one being on mind-altering substances; it is the only thing that explains why he believes he has offered anything like a sustained, credible argument here. And I’ll add that the folks at infidels.org must have been smoking something, too, to put this lunacy in their online bookstore. My current “Reads for Fun” book isn’t much fun right now – it’s The Oxford History of Ireland, and the authors are a pretty boring lot who could use some habanero peppers to spice up their writing. But there’s an interesting lesson for apologetics in one essay I’ve read, titled “Ireland After 1870” by David Fitzpatrick. Fitzpatrick goes on and on rather like a dentists’ drill about the clashes between Catholics and Protestants, labor, employment, World War 1, etc etc etc. But there’s something he doesn’t mention at all: The Titanic disaster. Um, you’re asking, why should he mention THAT? The Titanic was said to be constructed at the Harland and Wolff Shipyard in Belfast, Northern Ireland, in 1912. At the time it was supposedly the world’s largest boat, unmatched in both size and luxury. This project, had it existed, was surely a monumental boon to the economy of Ireland in general and Belfast in particular, as its construction employed hundreds of men in the Belfast area. It was also tried out in Belfast Lough, which was surely a remarkable enough spectacle that Fitzpatrick should have reported it in detail. Additionally, the Titanic disaster represented an immense loss of life that allegedly made world headlines. Among the 1500 plus killed were 123 Irish citizens. Surely if any of this were true, it would have warranted a mention by Fitzpatrick in his essay, but instead he remains preoccupied with such trivialities as labor unions! All of which just goes to show that even in a modern, low-context society, there are people who can (and do) manage to overlook events and things which other people think are “too important” to not receive a mention. The problem with mythicists like Doherty is not an uncommon one -- they assume that their values and priorities are everyone else's, so there must be something wrong with you if you don't do what they would do. Some time back I did some pieces on Christian Lindtner, a lunatic Holocaust denier who believes that the story of Jesus was influenced by various stories about Buddha. I should also take note of one other member of that crew, Zacharias P. Thundy. There are hardly any solid grounds to support the theory that the Jewish Sanhedrin had no authority to execute a serious law-breaker so much so the Sanhedrin had to send Jesus over to the Roman Governor. On the contrary, that local bodies held no judicial power of execution under Rome is quite firmly established, as we have observed in my piece on the trial of Jesus; see link below. This is such an elementary error that it is clear that Thundy has not studied the matter seriously. The bewildering image of unbroken colt ridden by Jesus during his triumphant entry into Jerusalem has this echo in the Sanskrit play: the colt is associated with Fate in the play: “Fate, like the colt, is reckless.” In the gospels, Jesus seems to be going along with fate or conquers it. Not much can be said of such imaginative description, which is little more than the typical “copycat” theorist tactic of collapsing down descriptions of an event into a “least common denominator” to forge an illicit parallel. Even so: “Fate” would play no role in Jesus’ actions; as a Jew he would accept at most a form of predestination, divinely sanctioned. Nor for that matter is either fate or predestination referenced in the Gospels. I have saved the best for the last. All of us vividly remember Jesus’s response to his accusers: “You have said it” (su legeis). These two words are exactly what Charudatta utters when he is accused by his own accuser Samsthanaka: “You have said it” (tvayi yavoktam)." First of all, as also shown in the trial piece, “you have said it” is documented as a known expression of Jesus’ time and culture. Second, it would not be surprising if a similar statement was also used as a circumlocution for the same purpose in other cultures. But it matters not at all, since Thundy is dating The Little Cay Cart to a time earlier than Jesus’ life, whereas serious scholars of the play date it to several centuries after Jesus. If that's Thundy's "best" his case is fairly sorrowful! We may have more to say of Thundy in another entry. For now, this much makes it clear he’s not a serious opponent. As it turns out, I have just a little time (no, actually I don't!) for a quick post on something I forgot -- comments on the January 2011 E-Block. Popular Preachers Past, Part 1: Arthur Pink's Pink Wall of Text -- New series where I profile popular teachers from the past. Pink's a real case of textual boredom -- I don't know what people see in this guy. Talk Like the Animals -- Critics make a big deal over passages in the Bible where animals (or other non-human objects) "talk". Is the fuss warranted? Not really. It's not like it's unexplainable -- in more ways than one. The Vocabulary Statistics Fallacy -- Critics sometimes try to deny authorship of Biblical documents based on word counts and vocabulary. It's a really silly way to decide authorship, especially since there were important factors in the Biblical world that make judgments on that basis questionable. Ghosts of End Times Present, Part 6: Mark Hitchcock's MacGuffin City -- Hitchcock is a well known dispensational author, and doesn't offer much new, but he has a special focus on the necessity of Babylon being literally rebuilt, which (as a preterist) I'd have need to address. The King James Konundrum, Part 1 -- I team with guest writer Rodney Wyrick for my first look at KJV Onlyism. Frankly I was astonished by the...well depth of ignorance in these guys' arguments. Maybe I shouldn't have been. Here’s a hub post for the Inerrancy and Interpretation series. The Ticker will have spotty updates the next 2-3 days (or maybe none) as I attend some training for my side job with USDA. We’ll be back in full swing hopefully Friday. Our series on inerrancy closes today with an evaluation of the finale exchange between Geisler and Gundry in a 1983 issue of JETS. My main concern is with how each side defends the proposition that genre artifacts like midrash can (or cannot) fit in with a doctrine of inerrancy. Unfortunately, Geisler spends very little time actually addressing this question, and spends far too much time accusing Gundry of trying to manipulate his readers by sounding intelligent. To his credit, he does at least engage as Moo did by trying to argue that Matthew is not offering midrash. But in terms of our issue of concern, this is what he offers. It is hard to worry much about this since Matthew (and the other Gospels) are just as readily accused of making up things Jesus said (or did) by those who place the Gospels fully in the genre of ancient biography. In other words, intention isn’t any sort of safeguard. However, there are more than sufficient ways to know what Jesus actually did or said even if Gundry is right. For one thing, we have the parallels in Mark, Luke and John, which Gundry would class as reporting straight narrative history. For another, as Gundry observes in reply, midrash “means historical tradition plus unhistorical adaptation” and “not sheer nonhistory”. In the end, the only way to get the assurance Geisler asks for hasn’t changed and is the same as it would be for any document – we have to figure out the intention of the author, and sift and then weigh evidence for historicity. Geisler’s implied threat of chaos is merely an overdramatized episode of pressing a panic button. Additionally, Geisler still fails to understand midrash properly, as it being a case where Gundry simply “denies that events reported in the Bible actually occurred.” Rather, Gundry’s case would be, as he puts it (but with which, note, I disagree in application) that for example, “the Magi were not created out of thin air, but as Matthew’s midrashic adaptation of the shepherds, truly historical figures.” Geisler seems to be unable here to get past a black and white “did it happen or not” classification scheme. Second, Geisler offers what can only be described as an astonishing analysis in which he argues that the purpose and intention of an author shouldn’t be part of our interpretive exercise. Gundry is accused of confusing the “what” of a passage with the “why” of a passage and it is argued that one does not need to know a “why” in order to understand a “what”. Really? The false step here is that simply because we do not know the purpose, this means that they did not know it. When evaluating a high context text, that sort of hypothesis is without basis. But even if it were not, it would remain that the law did have some purpose, even if it were not revealed to Israel at any point in its history by whatever means. Geisler’s most disturbing comment in this regard is, “No method is legitimate if it goes behind or beyond the text to find the meaning.” This sounds more like an obscurantist KJV Onlyist attitude than something that would be said by a serious disciple. In essence, it forbids us to seek defining contexts of all sorts – whether they involve insights from anthropology, from linguistics, or even from genre study. It goes further than that: To read our Bibles, we have to be literate in a language, and we learned that language from somewhere “beyond” the text. Gundry summarizes it well when he says, “Midrashic adaptations and embellishments are not reports. What is not intended to be taken as a report of an event is not a historiographical falsehood.” Geisler’s reaction to this is like that of the fundamentalist atheist (such as C. Dennis McKinsey) who takes all proverbs as absolute and refuses the counsel that proverbs were never meant to be taken as absolutes. Suggesting that proverbs are not absolutes is no more radical in principle than suggesting that Matthew was performing midrash. The only difference here appears to be Geisler’s level of comfort with the concept. In close for this series: In this exchange we see a struggle between those who are wedded to a low context, Western understanding of the text as a product and those who seek to contextualize the text according to its original purpose. The reader knows well that I have always stood firmly on the side of the latter, first because it is true, and second because it offers the best explanation for many textual phenomena. The struggle here is one that I believe will decide in part whether we are able to rescue many of the faithful from the inevitable cognitive dissonance that the former view will cause (and has caused), or whether we will watch many more slide into apostasy because they recognize the sort of answers Geisler offers as unsatisfactory. I am sure this debate has had many later manifestations (I've been involved in some myself!) so we'll surely revisit this topic again. Link: The one place where we can viably overlook author “intention “ is when something is presented incidentally. The sort of example I have in mind is what I write about here. We now continue our series on inerrancy with a look at an exchange between Norman Geisler and Robert Gundry in a 1983 issue of JETS. As it turns out, each man wrote two articles, effecting what was essentially a two round debate, with Geisler taking the lead. We’ll now evaluate the debate here, starting with Round 1 today and Round 2 tomorrow. Geisler opened with a proper question: Are there unorthodox methods of interpreting Scripture? Yes, no doubt there are, and Geisler gives several examples, such as Origen’s use of the allegorical method. That’s an expected first step. But the question is, would Gundry’s midrash thesis be such an “unorthodox” method? 1) Gundry argues that from a genre perspective, Matthew fits the model of midrash. 2) Given that midrash was Matthew’s intention, whether he erred must be judged according to that intention. Douglas Moo’s answer to Gundry was that Matthew did not intend for his whole gospel to be midrash, and with that I agree. Geisler, unfortunately, jumps right over this step and simply goes right to an evaluation that Gundry is wrong for no other reason than that he rejects the reports of Matthew as literal truth. In short, Geisler does nothing but start with the assumption that Matthew was intending to report literal history, which is the very question at issue. The answer to this (as Gundry would put it, though not me) is rather simple. For one, Jesus’ resurrection was also reported in documents Gundry classifies as non-midrashic. But more importantly, Geisler here assumes implicitly that the genre of midrash excludes all reportage of history as factual. This is shown further in that Geisler classifies midrash as “purely imaginary.” That is effectively an insulting evaluation of the midrashic genre. It is not “purely imaginary” – rather, it reports truth in an effectively coded way. As it is, Geisler spends far more time making observations about how dangerous he perceives all this to be, and why Gundry does not belong in ETS, than in actually analyzing why Gundry is actually wrong. He says we need a legitimate methodology, but does nothing to show that Gundry’s methodology is illegitimate. In his first response, Gundry correctly notes that “Geisler scarcely sticks a toe on the hermeneutical turf, where the real debate is taking place” and does not at all interact with any elements of his arguments for Matthew as midrashic. His admonitions would mirror my own, in terms of matters of authorial intent being a critical consideration, and in terms of Geisler (and others) taking genre into consideration when it comes to other texts like proverbs. This is indeed the critical issue at hand – and we’ll see whether Geisler engages it in tomorrow’s closing entry for this series. Reads for Fun: Byron Farwell's "Stonewall"
Our series on inerrancy will resume tomorrow after I get an important article from the seminary library today. 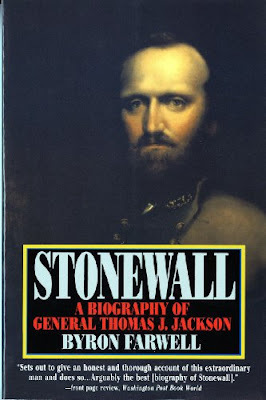 In the meantime here’s my latest Fun Read, a biography of one of my beloved Mrs H’s favorite people, Thomas “Stonewall” Jackson. She got interested in Jackson after seeing him portrayed in Gods and Generals. The movie gives a picture of a very devout man fighting for what he believes in, but as is usual with a movie, it doesn’t capture the whole. Farwell paints Jackson as a “dark” and also “quirky” figure – very devout, yes, but also very peculiar in his own way. What strikes me most is Jackson’s apparently extreme Calvinism, though whether he would have called himself a Calvinist I cannot say. His ideas of providence were such that he fearlessly went into battle, thinking that if he was meant to be killed, he couldn’t do anything about it anyway, so there was no reason to hold back. There are several descriptions of Jackson in this vein; the one that stands out to me has him calmly writing a message during a battle, and having a shell explode nearby that sent splinters from a tree all over his paper – which he casually brushed aside, then continued to write the message. On the darker side, Jackson wasn’t a very good team player. He was frequently vindictive towards those that offended him, and didn’t always let in his subordinates on what he was planning. He seldom thanked or praised others for their performance, and sometimes ignored them (though this may have been because he was going deaf). Of personal interest to me was that Jackson was briefly stationed in Florida before the Civil War and even made a march to a lake not far from where I live. Jackson is certainly an interesting and colorful figure, and Farwell does a good job bringing him to life. And by the way: For "balance" I have a bio of Ulysses S. Grant on the way! for me… and one other thing. Today’s a special day, though the one it is special for hardly knows it. He’s here in the house with me quietly napping by the window, enjoying the sunshine from his comfortable bed. It was three years ago today that he came to live with us – I mean, of course, our miniature poodle, Cocoa. We adopted Cocoa from an organization called Coastal Poodle Rescue (CPR). They’re typical of many such organizations that take in pets that are abandoned, abused, or in some cases, not able to be taken care of any more by owners who become too sick or financially burdened to care for them. His condition was so serious that the President of CPR was the one who first took him in. Then one of their Vice Presidents took over. It was some months afterwards that I went looking for a poodle to adopt and the timing was just right to select him. Three years later, you’d almost never know that it was the same dog. To be sure, there are times when Cocoa will bare some teeth, and I think these have connections to what was done to him by his prior owners. For one thing, he will sometimes object when he’s being dried with a towel. I suspect he was teased by being covered with a towel and being poked or prodded at. For other reasons, I suspect he was kept in a cage in a dark garage most of the time, and let out to play only infrequently – probably with a little girl, since he shows a particular fondness for those. Those flashes of anger are rare, though, and vanish almost at once. Most of the time, Cocoa is the sort of dog who will lick you constantly and won’t stop until you tell him to – at least twice. His affectionate nature leads me to see his abandonment as especially cruel. To this day, when we arrive home in the car with him, he seems tremendously excited (and relieved) that home was his final destination. He’s also a “Velcro” dog – as I go about my daily errands, he’ll always be sure that he’s never more than one room away from me. You’re certainly wondering why this subject, of all things, gets me going. It has a connection to a Christian worldview, to be sure. Gen. 1:26 makes us stewards of creation. Dogs – especially smaller ones like Cocoa, as it happens – are something we are particularly responsible for, and to which we owe a certain debt of care. There was a program on one of those nature shows that illustrated the problem. Tests were done comparing the reactions of wolves to the reactions of dogs in a certain experimental situation. Wolves and dogs alike were given a puzzle to figure out which would get them a reward. The wolves were zoo wolves who knew their keepers well and had a good relationship with them. Yet when they were unable to solve the puzzle, the wolves kept trying on their own to resolve it. In contrast, the dogs took a little while to look for a resolution to the puzzle, and then – this is the part that moves me – when they realized it was beyond them, they looked directly at the nearest human for help. I know this look well – Cocoa does it to me any time he needs water in his bowl, or can’t get his favorite toy out from under some furniture. This is the essence of our responsibility: We have bred into dogs the necessity and understanding that they are to depend on us when there is a problem. That is what makes it particularly cruel when, as one ASPCA ad puts it, the ones who care for these animals are the ones who abuse them. Abuse and neglect sends a dog a mixed message – while their nature compels them to stay with even a human that mistreats them. This is especially troubling when it comes to small dog like Cocoa. In the smaller breeds, we have also bred out the things which enabled these animals to survive the way their lupine ancestors did. A dog like Cocoa doesn’t have the ability to fend for himself for very long – though it does appear that Cocoa bettered his chances by attaching himself to a larger group of dogs and serving as their “night watch”. We get hints of that during the night. Nevertheless, here’s the bottom line: We’re responsible for the way these dogs are – which means, in my economy, we owe them one.